I performed two tests today and while I basically failed my objectives, there was some good news. I moved the oxidizer valve closer to the injector hoping to get better throttle response. I also modified the ignition sequencing. The net result was less than desirable - I had a hard start on the second test of the day. As you can see in the picture, there is fire coming out of the flange that holds the injector plate onto the chamber - the gasket failed when the combustion chamber pressure hit ~1000 psi momentarily. The good news is that there is no other damage to the motor and gaskets are easy to make. The other bit of good news is that my redline software performed exactly as it was intended to do. I created a module in the DAQ software that triggers when any of the 4 analog channels I'm monitoring (thrust, chamber pressure, injector pressure, tank pressure) exceed predetermined values. When the redline module triggers, it sends a logic signal to the engine controller module and the engine shuts down. In both tests today, the redline was triggered and the oxidizer valve closed. The second test, pictured above, had a duration of about 0.5 s before the valve closed. 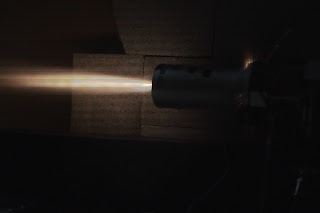 I thought I'd share a couple of pictures which highlight the differences between injecting liquid versus gaseous or saturated propellants into a combustion chamber. This first picture is of a single injection orifice flowing water from my garden hose - the stream is very laminar with very little dispersion. Engines with liquid injection usually use impinging streams to accomplish the mixing that is required for good combustion stability and efficiency. Robert Watzlavick has several good pictures of an impinging liquid-liquid injector on his website, in addition to this one. The last picture is of the same injector in picture number one flowing liquid N2O instead of water. In this case, the saturated liquid flashes to vapor immediately due to the much lower atmospheric pressure. The resulting plume is easily 10 times the diameter of the injection orifice. Gaseous injection would probably not result in such a large plume but would still expand much more than the water above. Here is a movie of the motor that I have been working on recently. It is a restartable, long burn N2O/HTPB hybrid. I've included some thrust and chamber pressure data as well - to me the data is more interesting than the movies sometimes.